If the mud layer is very thick clay, start by gently removing some with a smooth object, like an old spoon. Other soils will probably not need this step. With leather, avoid the use of detergents or soap, and try to avoid thorough soaking. Fabric boots may clean better with mild soap and a brush. Keep water from entering the boot as much as possible. See “Wet Boots” section if not. A clothes-dryer may shrink or crack boots. Heat of fire or hot air may also damage them. When dry, inspect and touch-up seams and edges with a toothbrush (especially where the sole is attached). A slightly-damp cloth will remove any residual haze. 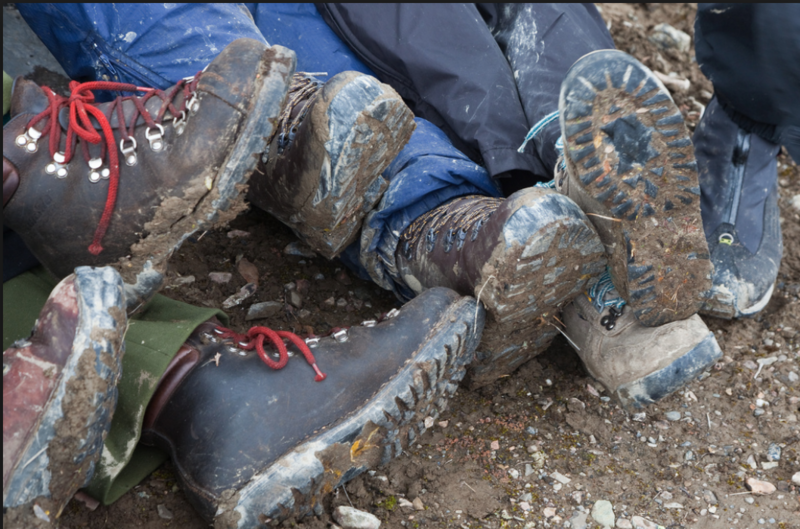 Re-water-proof your boots with a product approved by their manufacturer, paying special attention to seams, edges and crevasses. The goal should be to dry them as quickly as possible, BUT without using heat. Air-drying is best, but even with a fan, if the boots are very wet inside, and especially if they have thick linings, they may take more than a day to air-dry. This may result in mould and bacteria growing in them, weakening the structure, and smelling terrible. As well as a fan, something inside may also be needed. The first two possibilities may already be in your house. Before you start, remove laces and insoles (or orthotics). Then add one of the below. Newspaper: Pack the boots tightly with balled-up newspapers, (keeping darkly-inked pieces inside the balls – or just don’t use them). Change 2-3 times a day (more often at first), until the balls come out crisp and dry. – Pro: Cheapest – Con: Least effective of these. Rice: [I’ve used this myself – Ed.] Fill ‘em up, and (as for newspaper) change regularly. Just spread used rice on a cookie sheet and bake under low heat (at or less than 120°C, 250°F) for a while. Re-dried rice can be re-used immediately, or stored in an air-tight container for re-use later. – Pros: Bulk rice is inexpensive, and easy to use – Con: May grow mould itself if you’re not careful. Desiccants: Many are toxic or carcinogenic, so bulk (un-packaged) silica-gel and other chemicals should be avoided. Packets of silica-gel beads (enclosed in, e.g., Tyvek™ envelopes) are safer, and are even used in food and drug packages. Clay desiccant is very safe, but it should also be used in bags, or you’ll just make mud in your boots! – Pros: Most effective, will not rot, most reusable (bake as per rice) – Con: Expensive. Removing insoles after every hike is a good idea; Moisture accumulates from sweat. Even if the boot feels dry, things may grow.